Didn't see any board meeting in which this action was discussed. 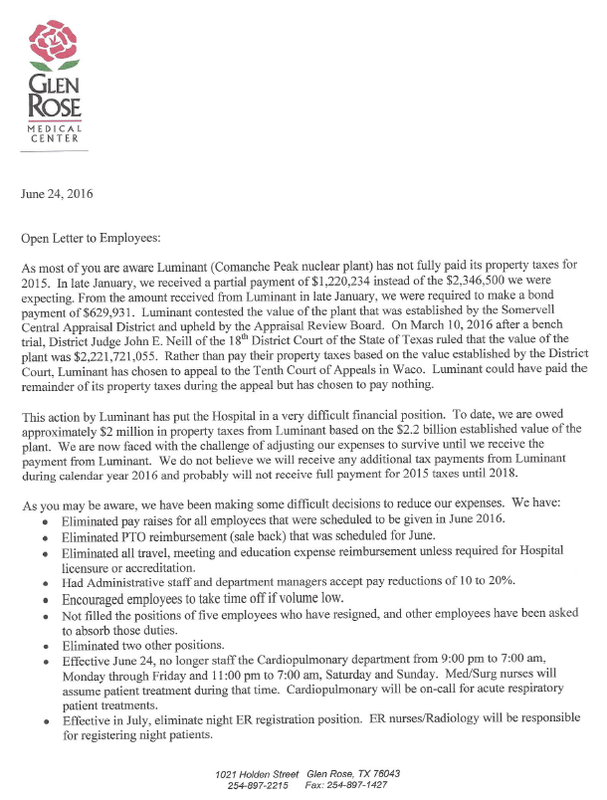 As most of you are aware Luminant (Comanche Peak nuclear plant) has not fully paid its property taxes for 2015. In late January, we received a partial payment of $1,220,234 instead of the $2,346,500 we were expecting. From the amount received from Luminant in late January, we were required to make a bond payment of $629,931. Luminant contested the value of the plant that was established by the Somervell County Appraisal District and upheld by the Appraisal Review Board. On March 10, 2016 after a bench trial, District Judge John E Neill of the 18th District Court of the State of Texas ruled that the value of the plant was $2,221,721.055. Rather than pay their property taxes based on the value established by the District Court, Luminant has chosen to appeal to the Tenth Court of Appeals in Waco. Luminant could have paid the remainder of its property taxes during the appeal but has chosen to pay nothing. This action by Luminant has put the Hospital in a very difficult financial position. To date, we are owed approximately $2 million in property taxes from Luminant based on the $2.2 billion established value of the plant. We are now faced with the challenge of adjusting our expenses to survive until we receive the payment from Luminant. We do not believe we will receive any additional tax payments from Luminant during calendar year 2016 and probably will not receive full payment for 2015 taxes until 2018. Eliminated pay raises for all employees that were scheduled to be given in June 2016. Eliminated PTO reiumbursement (sale back) that was scheduled for June. Eliminated all travel, meeting and education expense reiumbursement unless required for Hospital licensure or accreditation. Encourged employeees to take time off if volume low. Not filled the positions of give employees who have resigned, and other employees have been asked to absorb their duties. Effective June 24, no longer staff the Cardiopulmonary department from 9:00 pm to 7:00 am Monday through Friday and 11:00 pm to 7:00 am Saturday and Sunday. Med/Surg nurses will assume patient treatment during that time. Cardiopulmonary will be on-call for acute respiratory patient treatments. Effective in July, eliminate night ER registration position. ER nurses/Radiology will be responsible for registering night patients. We will need to do more to further reduce expenses. Our goal is to reduce expenses by $125,000 per month (that is a big number). To date with the actions we have taken including the departure of Dr Laughton, we are at a savings of $68,696 per month. We are looking at all our options including changing our employee benefits (amount paid by Hospital toward health insurance, Hospital match of retirement plans, and HSA contribution). No decision has been made relative to employee benefits, but it is an area that must be examined. To better answer your questions and concerns, I will be available in my office most every Tuesday and Thursday from 11:00 am to noon to answer any questions (related to Luminant or other issues), give you an update on Luminant and our response, address any rumors you may have heard or just listen to your frustration. No appointment is required; just walk in. I am available. @HomeGrownMatters So with you. I believe that the decision to send an open letter to the employees should have been discussed in a meeting with the board making that decision. Seems like the hospital is being run by Reynolds as if it's still a private hospital. I suspect that the reason Ron Hankins was made board president was because 5 of the people elected were newbies and believed Hankins, by dint of being a holdover, was qualified. In light of what I consider to be highly irresponsible comments by Hankins at the last meeting, in which he said Luminant was *evil* and a *bully*, seems that he isn't a measured, thoughtful person with not only an eye on the past but on the future. AND with you on the rest. There have been some collasally bad manaqement decisions by Reynolds, who, after all, is himself an at-will employee who can be fired by the board, but who has managed to evade even one yearly performance review. We received phone call from Donna Miller yesterday that our insurance benefits will be changing immediately. All employees will have tomorrow only to sign up or lose their benefits. Rumor has it that premiums will go up and we will lose vision insurance. No email has been sent out at this time.